Not All Who Wander Are Lost: Long live Keens! As anyone who has spent time with me over the past couple years can tell you, I love my Keens. I wear them almost every day. I thought for sure that the temperatures of Antarctica would put an end to that. It hasn't. Today, it is pretty warm at 3 F and I was shoveling snow for a while, but the Keens (with a thick pair of socks) got the job done. The only time I don't wear them is when I know I'll be outside for a long time. When I first posted about my fire extinguisher class, I didn't think there were any pictures of me because I didn't see anyone taking pictures. However, in the weekly base review I saw this picture and recognized the footwear on the middle person as Keens. It had to be mine. Who knew that Keens could firefighting and cold weather footwear. Keen should be hiring me as a product marketer or at the very least a tester for taking their footwear to the extremes. My weekend was a quiet one. I played Settlers of Catan (and was a point from winning), danced at a Future Fantasy party, talked on instant messenger, called Botswana, ate brunch, read, watched the Penguins lose a close game, watched The Holiday (not great), napped, and finally slept. It was good day for an unproductive one. Maybe being unproductive (i.e. restful) is productive though. All depends on your definition. Either way, I don't feel as mentally fried as I did last week. It should be a good week. Your friend John Bain pointed us towards your blog - I know this was posted a little while ago, but I've really been enjoying reading your blog and just had to write! 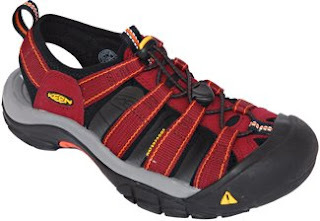 I'm the Web Marketing Manager at KEEN and I was wondering if you'd like to be a part of a new KEEN online community? I'm relatively new to KEEN and am in the process of putting together what the details of the community look like, but basically I'd love for you to test out the new site and be one of the first people to tell your story of what you're doing in Antarctica. Would that be of interest at all? If not, no worries! And thanks so much for being such a dedicated KEEN fan - it totally makes our day to hear stories like yours!